Meet with the troop Eagle Scout Mentor to discus a high level view of the plan. When the scout addresses issues/suggestions on the proposal, meet with the Troop Committee for approval of the project. The outcome of this meeting will determine if the Troop leadership agrees that the scout is ready to proceed with a project or should wait until he is better prepared as a leader in the Troop. Review the "Trail to Eagle" guide provided by the National Eagle Scout Association (NESA). Once approval has been given to proceed the scout should research potential projects that meet the Three Fires Council guidelines (e. g : 100 hours of effort) and the National BSA requirements. The objective of the project is to promote leadership skills; therefore, the candidates involvement is primarily to organize and manage the project. As a "rule-of-thumb" the potential candidates accumulated time should not exceed 25%-50% of the total time necessary to complete the project. After initial approval to collect additional data (only), the scout should complete a draft copy of the "Life to Eagle" project book and secure agreement from the organization that will benefit from the project (e.g. : Church, Home shelter, Park District, etc..). It is permissible for the scout to complete the workbook in an electronic format, however it is not a requirement. An electronic copy can be obtained from a variety of locations however the workbook referenced on the NESA web site is recommended. The NESA web site offers three formats; Microsoft Word (DOC), Adobe (PDF) and Microsoft Rich text Format (RTF). A PDF file is also attached at the end of this document. Following completion of the draft, the scout should once again schedule a meeting with the Eagle mentor to review the draft. The draft must be complete and written in a professional manner. This process will be repeated until such time as the quality of the draft is deemed to be ready for review by the District representative. Following annotation by the appropriate individuals (e.g. : Scoutmaster, Committee Chair, Project Representative) the scout may then schedule a review with the District representative. After an initial review with the District Representative the scout may be required to collect additional information and schedule another review. Once the project has been approved by the District, the scout can then, and only then, begin work on the project. The scout will be scheduled for a Scoutmaster review once the project is completed and annotated appropriately. Following this review the Scout's records will be sent by the troop to the Council for review and validation. Documentation must be submitted to the District before the scout's eighteenth birthday. Following Council approval (approximately 4 weeks) the Eagle project document will be sent to the District Advancement chair who will then assign a District representative to convene an "Eagle Board of Review" (Approximately 2 weeks). This review will be managed by the District representative with attendance by three adult parents (volunteer non-uniformed leaders) from the troop. A signed advancement report is delivered to the Council, from the troop, which will be forwarded to the National Council for final approval. Once National has approved the documentation the candidate is "officially" and Eagle scout. The date of his rank is back dated to when the "Eagle Board of review was held. 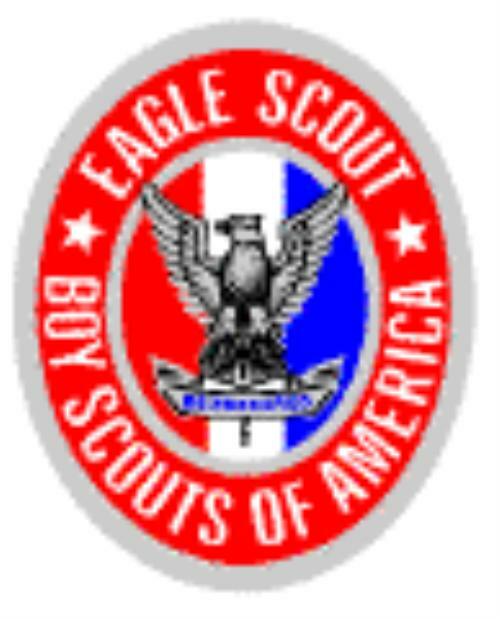 National will provide the Eagle Scout awards that will be presented to the scout. 512-927_fillable.pdf Fillable Eagle Project Workbook. *MUST* use Adobe Acrobat Reader to edit the document.